Have you ever been walking down the street and seen a beautiful plant and wanted to grow it yourself? Join us in the garden to learn how to take a cutting from a plant and get it to thrive in your own home as part of our Garden Education series! We’ll also be working in the garden! 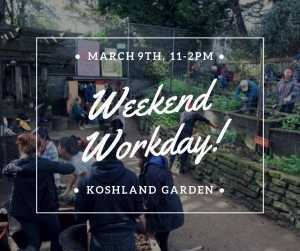 Connect with friends and neighbors as we mulch, weed, prune, compost, disperse wood chips, and do some general clean-up in the beautiful and historic Koshland Garden! This event is open to the public and family-friendly. Contact Karen@communitygrows.org for questions or more information.